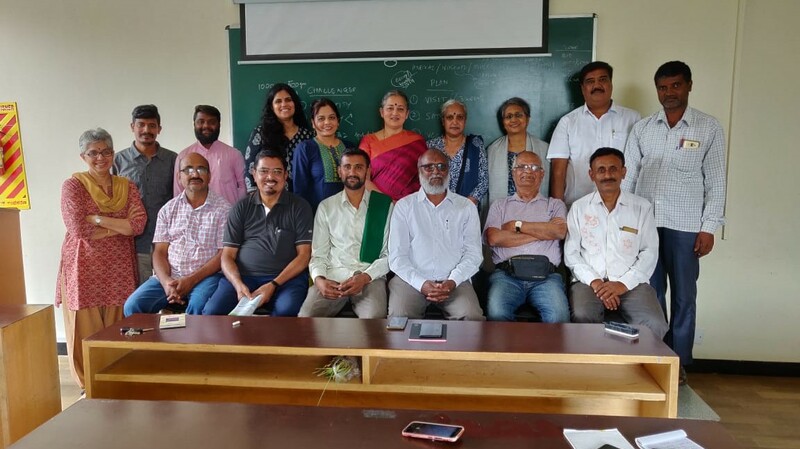 Farmers located on the outskirts of the city meet members of Solid Waste Management Round Table to discuss Swachagraha Compost Connect campaign in Bengaluru on December 4. Sometimes, things take longer than you think they will. And then, they happen faster than you thought they could. SwachaGraha Compost Connect (SGCC) is one such dream project conceived by Solid Waste Management Round Table (SWMRT), Bengaluru, that will work towards connecting urban compost producers with rural farming community with the sole intention of sending the precious organic waste coming out of our kitchens and gardens back to the soil in the form of compost. I am going goose-bumpy as I punch in these lines on my laptop: Yes, it is possible to mitigate agrarian crisis just by segregating your organic waste and then composting it. If you are already at it and have excess compost which you have no idea what to do with, join this campaign and see how you can help the farmers mitigate the ever-depressing agrarian crisis. It’s a dream of any passionate SWM activist: To send the priceless biomass back to the soil. But most often, we don’t know how. At SWMRT, all of us have come across situations wherein several volunteers spearheading composting initiatives in their apartments were seeking help to sell it. However, lack of connect with the farming community posed roadblocks and the conversation ended where it started. Driven by passion and frenetic reflectiveness, SWMRT decided to create pathways in the most humble ways possible. But first, we needed to connect with potential buyers to take the campaign forward. For this, we sought help from noted activist Vasu of SOIL who instantly supplied us with the contacts of 10-12 farmers. And then, it just took off the ground! In our first ever meeting of SGCC today, organic farmers from Kolar, Chinthamani, Mulabagilu, Ramanagara and Anekal came to the meeting with their heads buzzing with doubts and questions and hearts filled with hope. The enthusiasm the meeting generated laid bare one thing for sure: There’s a lot of hunger in this world. Soil’s hunger for humus is probably the least understood and the most neglected of them all! SGCC is all about reducing this urban-rural chasm. Will there be heavy metal contamination in the compost which can damage my land irreparably? Will the cost per kg of compost be so high that it becomes unaffordable? Will the compost contain high quantities of weed seeds that it eventually becomes a labour-intensive exercise for us? Is there a possibility of selling our organic grocery, fruits and vegetable to a community and load up compost from the same spot on our way back? While we had answers for almost all of their questions, what had us all perked up was the suggestion from a farmer from Ramanagara that they would be willing to sell neatly bagged organic produce to the same community and go back home in a vehicle loaded with compost. This added an entirely new dimension to the whole concept and all the involved are willing to figure out ways to make it happen. If dream has a sound, won’t it sound just like this? The concept will evolve as we move on. Somashekar from Kolar was of the view that “we should let it take off somewhere and then see how it goes instead of getting bogged down by all kinds of doubts”. To make this happen, the farmers are ready to do field trials by using your compost in a small patch and then decide the future course of action. If yours is a community that’s ready to sell quality compost, then one of us from SWMRT will visit your apartment to study the method you have in place, the quality of segregation and of course, the compost. Once we are sure that yours is a sustainable method and NOT a 24-hour composter output, we will connect you to the farmers who are located close to your location. We are planning to create zone-wise groups with a roadmap neatly laid out. Price point, strategies to figure out the quality of the compost, frequency of pick-up are the most important matters to be discussed and decided in the forthcoming meetings. Write an email to endlesslygreen360@gmail.com with relevant details and contacts if you want to be included in this network. Here’s a chance for you to take your meaningful initiative you are doing for your community miles further. Join in! This entry was posted in Endlessly Green and tagged biomass back to the soil. loss of biomass, SGCC, Swachagraha Compost Connect, SWMRT. Bookmark the permalink. Savita! Very happy to know your progress from starting the composting at your apartment complex to reaching out to the agrarian community thus completing one circle.. Fantastic initiative!! Would like to connect with you!! Our Apartment is into composting… waiting to hear from you. Could you please add Sowparnika Sanvi Phase 1 (216 flats) & phase 2 (250 flats) to your community. We will give segregated kitchens waste separately. Could you please invite us for next meeting. Thanks for the comment. Need the numbers of the persons to be added to the network. Write a mail to endlesslygreen360@gmail.com with these details.